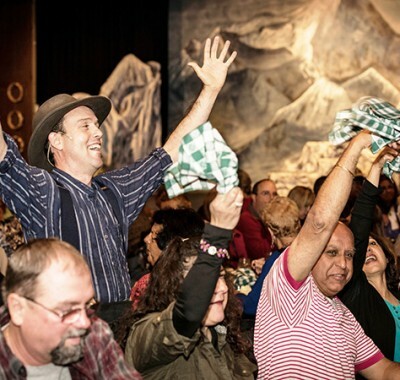 Kick back and laugh after a full day of sightseeing by joining in on this evening-long jaunt to a family-style roadhouse to see a side-splitting musical comedy about the first men to reach the summit of Denali (formerly Mt. McKinley). The evening begins with a family style dinner featuring Alaskan salmon, smokehouse BBQ, hearty mashed potatoes and house-baked apple crisps for dessert. Come hungry because this delicious spread is all-you-can-eat. While feasting on this savory meal, enjoy wonderful performances by a talented group of musicians and singers who hit all the right notes with lively songs and heartfelt sounds. After dinner, unwind over a cup of complimentary coffee or tea or, if the mood suits, soda, beer, wine and cocktails are available for purchase. As total relaxation sets in, get ready to experience a truly delightful show that captures the legendary adventures of the first men known to scale the highest peak in North America, Denali (formerly Mt. McKinley), which juts 20,310 feet high into the vast blue sky. Also known as Denali, which means ”The Great One,” this towering mountain features two significant summits and five glaciers that flow down from the mountain’s steep slopes. Through clever lyrics set to engaging music, the gifted cast tells the entertaining story of these early explorers, including Alaskan native Walter Harper, the first man to reach the main summit. Take in the indomitable pioneering spirit of this determined group who bravely made their way through the Alaskan wilderness to reach new heights, which, according to one of the men, explorer Robert Tatum, was like ”looking out the windows of heaven.” Enjoy the rollicking ride while experiencing the thrill of discovering gold and the unforeseen dangers faced when climbing this mammoth peak. Relish the spirited music full of funny, lighthearted lyrics and the gifted ensemble that bring this original musical and a slice of Alaskan history to life. Theater is located at the McKinley Chalet Resort property. Family-style served meal including smokehouse BBQ & Alaskan Salmon. Show portion of this tour is 50 minutes. An array of optional excursions are available at the Denali Princess Wilderness Lodge. Visit the Tour Desk at the Denali Princess Lodge or call 1-800-426-0500. Alaska Land Excursions may be cancelled up to three days prior to travel without any cancellation fees. Land Excursions cancelled prior to the cancellation deadline will be refunded to the credit card that you provided. Excursions cancelled within three (3) days prior travel are subject to a 100% cancellation fee, unless the operator, at their sole discretion, is unable to operate the program due to unforeseen circumstances. All sales of tours booked while on your land tour are considered final at the time of purchase and are 100% non-refundable except in the case of an operator approved cancellation.